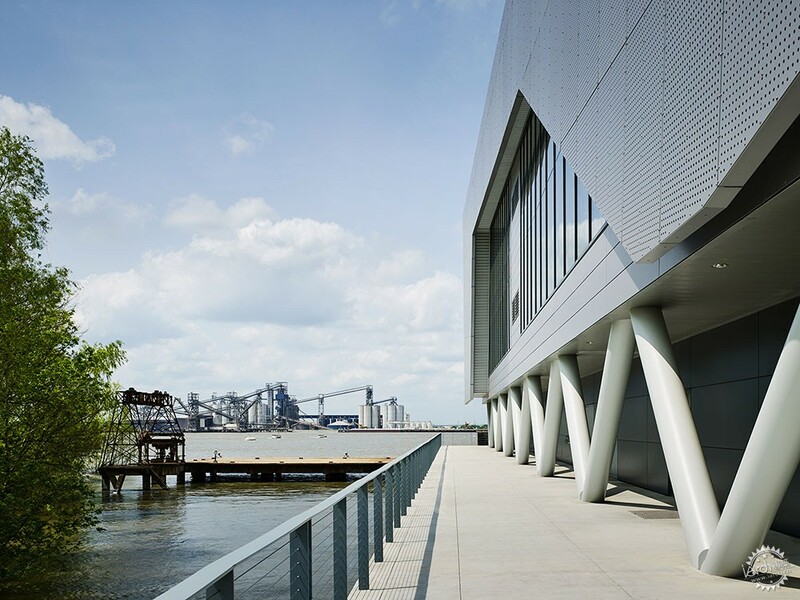 Global architecture firm Perkins+Will has created a waterfront building for a research organisation in Baton Rouge, Louisiana, that is designed to remain fully functional during floods. Founded in 2011, the Water Institute of the Gulf is a nonprofit organisation that conducts research focused on water systems and coastal communities. Its new headquarters is located on the banks of the Mississippi River, next to a historic dock that once played a key role in local trade. 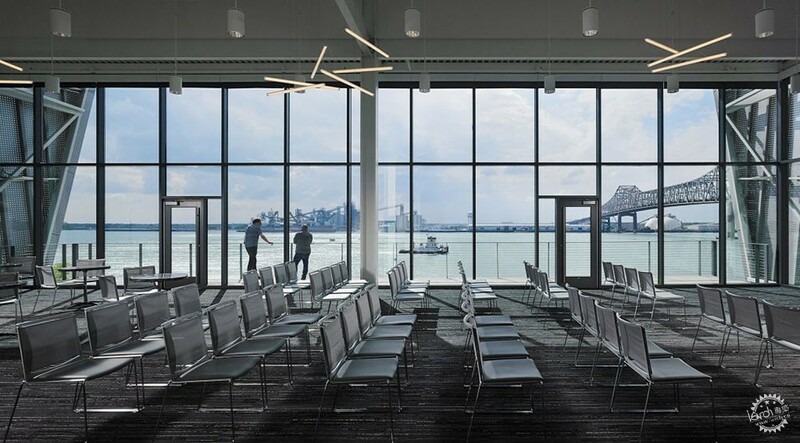 While designing the new facility, Perkins+Will – a US-based firm with offices around the globe – drew upon the region's maritime heritage. 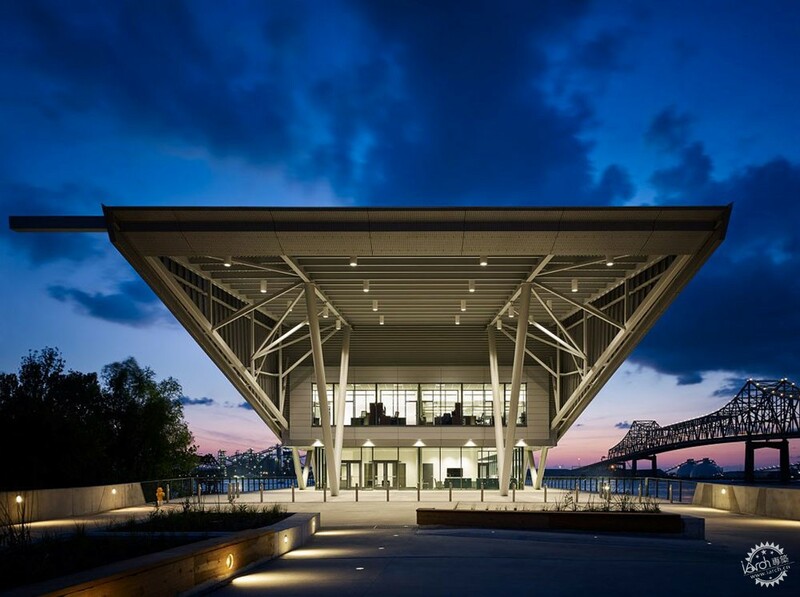 "The building's all glass and steel aesthetic pays homage to the area's freight industry, where ocean-going vessels off-load heavy cargo onto barges to be transported upriver or onto rail for inland shipment through Baton Rouge," said the firm in a project description. The wedge-shaped building sits atop a concrete pier that rises 35 feet (10.6 metres) above the water. The elevated position enables the building to withstand seasonal flooding, which can leave the shoreline completely submerged. "The building was designed to sit above the maximum anticipated flood line," the team said. "While the water rises and submerges the surrounding landscape, the building remains accessible and fully functional." 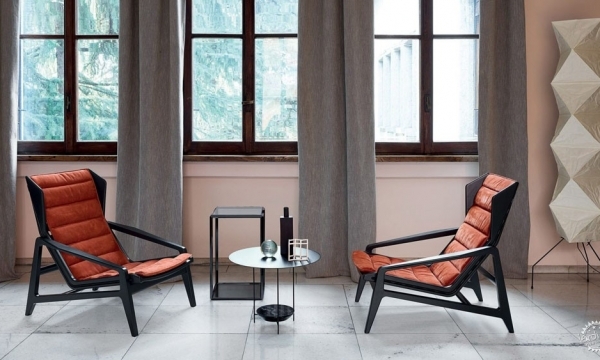 Rectilinear in plan, the building has glazed walls that offer extensive views of the water. Draped over the building is an angular shroud made of perforated metal, which helps mitigate solar heat gain and gives the building its sculptural profile. On the east elevation, the metal screen and roof extend far beyond the building envelope, forming a canopy that shades a ground-level entry plaza. 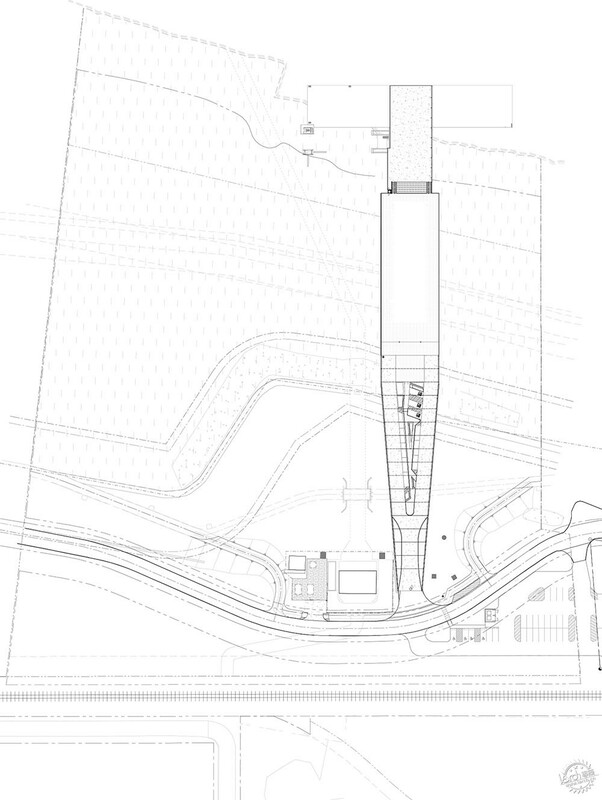 The deep overhang is supported by giant V-shaped columns. 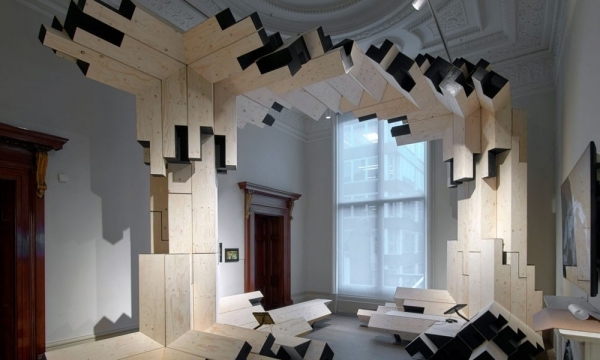 A walkway encircles the building, allowing visitors to peer inside and observe research activities. 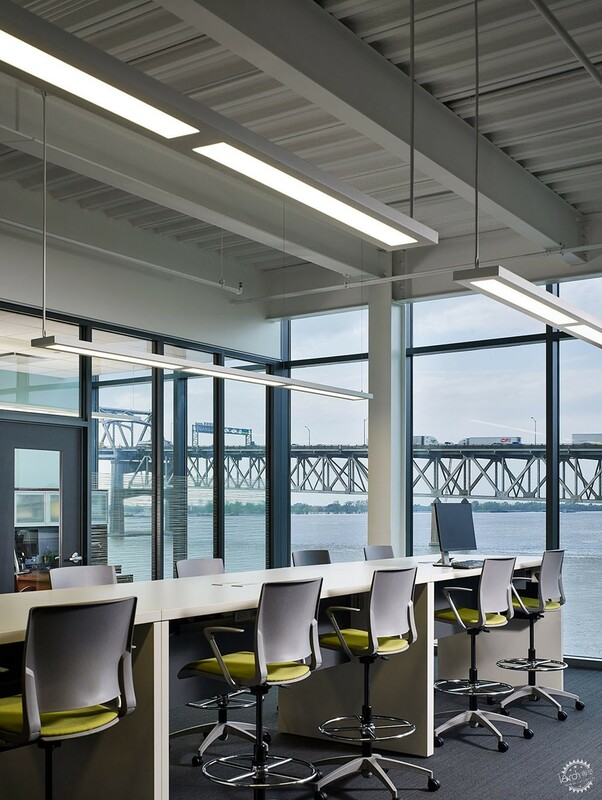 Encompassing 34,000 square feet (3,159 square metres), the facility contains a range of workspaces. The ground floor houses offices and laboratories, while the second floor contains the main offices for the institute. The third level encompasses an 8,000-square-foot (743-square-metre) conference centre, where the organisation is able to host a range of events. 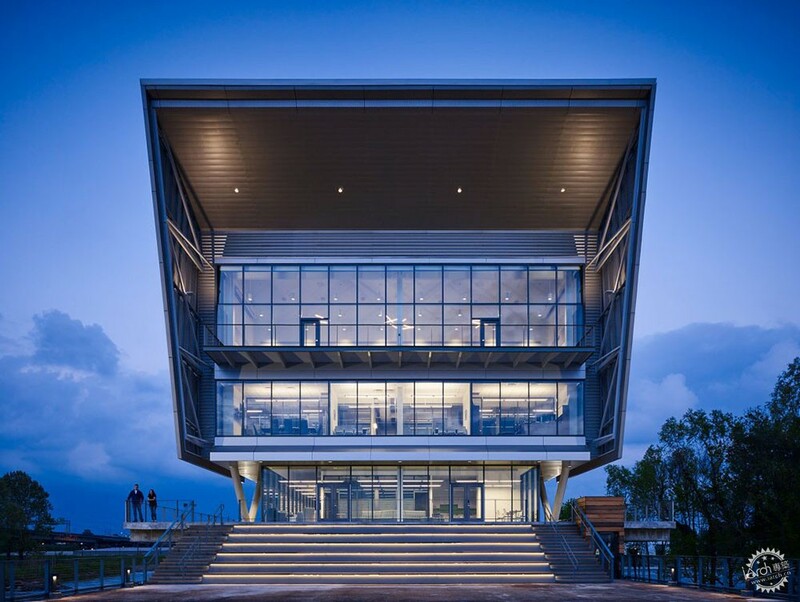 The Water Institute building serves as the centrepiece of the new Baton Rouge Water Campus, which is designed to serve as a hub for river and coastal research. Other organisations on the 35-acre (14-hectare) site include the Louisiana Coastal Protection and Restoration Authority, and the Louisiana State University Center for River Studies. Baton Rouge – the state capital of Louisiana – lies about 60 miles (97 kilometres) north of the Gulf of Mexico. Other projects in the southern US city include a visitor centre for an 18th-century plantation by Trahan Architects, which features staggered glass walls set within a grassy landscape. Photography is by Nick Merrick.